The Entertainment Maven started off as a resource for all things entertaining, and it still is to some extent, but it has become clear that my major area of focus will be genre films. I just never anticipated how much fun it would be to immerse myself in the film world. However, that does not mean that I will completely shed the idea of reviewing other forms of entertainment. True to my word, I dug back a couple of years in the Playstation 3 archives to share with you one of the greatest video games I have ever played in my life; Demon’s Souls. 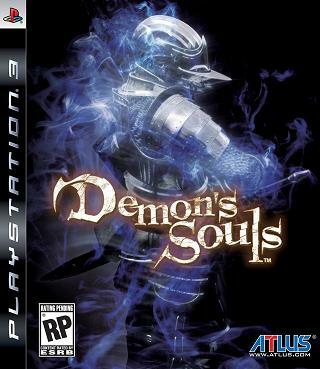 Demon’s Souls was developed by From Software and published by Atlus. I personally love both of these companies, From Software, for their wonderfully immersive dungeon hack-and-slash romps, King’s Field 1 & 2 for Playstation 1, and Atlus, for being one of the best publishers over the years of Japanese strategy role playing games, Disgaea for example, that companies were convinced North American audiences would not enjoy. Demon’s souls is an action-RPG in which you singlehandedly take on a horde of demons that have decided to make the land of Boletaria their personal soul harvesting ground. It is up to you to stop them, and if you fail, don’t worry, it will only cost you your immortal soul. The second reason why you should free up your day before playing Demon’s Souls is that you are going to die. A lot. With approximately 25 levels of monsters to fight through, you will be one of the lucky ones if you die less than twenty times a level. This may sound completely demoralizing, and death is as frustrating as it always has been, but I assure you that with most deaths comes increased motivation to level the score with these ghastly demons. If you like RPGs and you’re willing to give a difficult game a shot, then pick up Demon’s Souls for PS3. It can be found for a fraction of the cost of a new release game. Also, the sequel Dark Souls, sure to be one of the best games released in 2011, is set to come out in October. It would be an impossible task to hope to survive in Dark Souls for more than a second, without the prerequisite skills that need to be picked up in Demon’s Souls.